Hit the heated pool with the whole crew - little ones go giddy for the children's splash pad. Went a little too hard on the slopes? That's what jetted hot tubs are for. Sip on specialty cocktails and chow down on Mongolian stir-fry at the onsite bar & grill. A fully equipped en-suite kitchen lets you cook up whatever your crew is craving. At just steps to the Heavenly Ski Gondola, you'll be first to the fresh powder. Reach maximum relaxation mode with 4 outdoor hot tubs. Lace up those hiking boots! Van Sickle State Park Trailhead is just a 4 minute drive from the resort. Get some tee times on the schedule, Bijou Municipal Golf Course is just a 7 minute drive. For your next winter getaway enjoy the comforts of home, the amenities of a resort, and covetable slopeside real estate by booking a villa at Marriott’s Timber Lodge. Nestled in the heart of Heavenly Village, this resort puts you steps away from both choice skiing and exciting nightlife. Casinos in nearby Stateline are a mere five minute walk away, while the Heavenly Gondola is just outside your door. Fuel for a day on the mountain with a heart homemade breakfast thanks to a fully equipped kitchen. Once everyone is done carbo-loading on your world famous chocolate chip pancakes, just gear up and head out! The Heavenly Gondola lift is just steps away, ready to whisk you up the mountain to explore Tahoe’s largest ski area. With 4,800 acres of terrain, 30 lifts and multiple base villages on both the California and Nevada sides of the mountain it’s no wonder this place is called Heavenly. Got a little one not so keen on skiing? They'll love The Cubhouse, a supervised playroom chock full of toys and games - though Heavenly has a top notch ski school. Once you're thoroughly snowed out for the day coast back down to the village to meet back up with your crew. See who’s up for an aprés soak (a unanimous “Me!”) and hurry to the suite to swap ski jackets for swimsuits. Make the quick dash to the outdoor hot tubs and let the jets work out any kinks as you swap stories from the slopes. Villas at Timber Lodge are spacious, inviting and wonderfully appointed. A fully equipped kitchen (and Riley’s supermarket across the way) make home-cooking a breeze, while in-unit washer/dryer makes sure everyone has fresh base layers to ski in. The one-bedroom unit includes a king in the master and a queen sofa bed in the living area, prime for couple’s trips and small families. The two-bedroom, two-bath suite adds an extra king and sofa bed in the second bedroom, sleeping groups of up to eight comfortably. A living room with a cozy fireplace and flat screen TV is a great space for quality time with the crew, though a TV in every room lets everyone watch what they want. 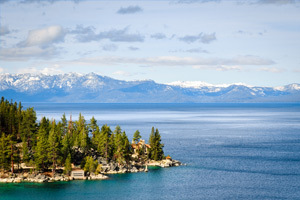 Staying in the heart of Heavenly puts you right by all the action that South Lake Tahoe has to offer. An array of dining options surround Timber Lodge, from dinner and a magic show at The Loft, to artisanal pies in a casual setting at Base Camp Pizza Co. But for aprés drinks and a tasty meal look no further than the lobby. At Fire + Ice, the resort’s onsite bar and grill, chefs cook up Mongolian-style custom stir fry dishes right before your eyes as you sip specialty cocktails from the bar. Planning a grownups-only night on the town? No need to elect a DD because Harrah’s is just a five minute walk away! There you can test your luck at the casinos, hit the dance floor at Peek Nightclub, or catch a show in the Lounge.